On this camping trip near Shimla, you'll spend the day indulging in adventure activities like Burma Bridge or commando net, and spend the night camping in deluxe tents under a starry night sky. At a campsite nestled deep in the mountain valleys of Shimla, you can grab undulating views of rolling Himalayan hills, tall and vast forests and misty mornings of clouds and fog. Get your heart pumping with adventure activities like spider web, commando net, tree bridge and more, or simply challenge your friends to a game of cricket or basketball. At an additional cost, you can even go rock climbing, rappelling, valley crossing, guided treks and several such activities, all set to the backdrop of an enchanting campsite. Located just 45-min drive away from the hill station of Shimla, your campsite has an abundance of Himalayan wilderness, from heavily wooded jungles to the picturesque Shimla hills. The forests around Shoghi, the closest village to the campsite, makes for the perfect setting to go on short, guided treks. During this camping trip, you’ll stay in deluxe tents equipped with the comforts of a king-sized bed, mattresses, blankets, side table, fan and chairs. The tents come with an attached washroom and hot, running water. The campsite is also equipped with a multi-cuisine kitchen to serve delicious meals. 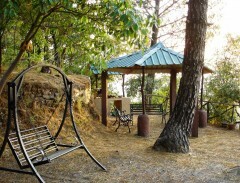 • Stay in the rustic hills of Shimla on a camping trip near Shimla. 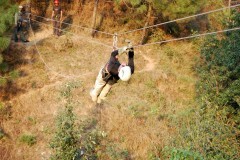 • Participate in adventure activities like Burma Bridge, tree bridge and more. • Sleep in deluxe tents pitched under a starry, night sky. 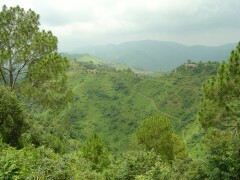 • Explore the forests and mountains of Shimla. 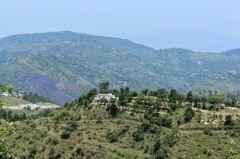 Camping near Shimla is a non-strenuous activity. However, if you have any cardiac or respiratory conditions, or suffer from knee or spinal problems, please consult your doctor before booking this trip. Travellers are required to adhere to instructions of the tour guide while undertaking any adventure activity during the camping trip near Shimla. Consumption of alcohol and drugs is strictly prohibited while undertaking any adventure activity. For cancellations made 10 days or more before check-in date of the Shimla camping trip: 75% refund. For cancellations made 3-9 days before check-in date of the Shimla camping trip: 50% refund. For cancellations made less than 3 days before check-in date of the Shimla camping trip: No refund. Post/preponing dates will be treated as a cancellation. Check-in time at the campsite is 13:00 hrs, while check-out time at the campsite is 12:00 hrs. The activity package for adventures during the camping trip near Shimla includes one session of rock climbing, rappelling, valley crossing each as well as a half-day guided forest hike, a 2-hr night trek, all activities on the obstacle course and one evening of bonfire with barbeque snacks and soft drinks. The activity package is not included in the trip cost, and can be arranged for an additional cost of INR 1,600 per person. Accommodation for children younger than 5 years of age is not charged, without an extra bed. Accommodation for children between the ages of 5-12 years is charged at INR 1,250 per person, with an extra bed. Accommodation for children older than 12 years of age, considered as extra adults, is charged at INR 2,150 per person, with an bed. The tour operator takes utmost care to ensure safety of the travellers and shall not be held responsible for any mishap or accident during the camping trip near Shimla. There is no drop-off for this trip Shimla camping trip. Day 1 of the Shimla camping trip: Check-in and enjoy! Arrive at the campsite by 13:00 hrs and check into your deluxe tents. You can spend the rest of the day at leisure. Take a short walk around the campsite and explore its green, mountain surroundings. 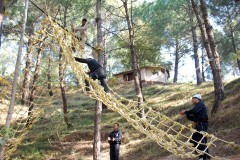 You can spend the afternoon indulging in adventure activities like Burma Bridge, spider web, commando net or tree bridge. You can play some cricket, basketball or challenge your friends to a match of volleyball. If you're travelling with children, you can spend some time at the play area, equipped with swings, slides, hula hoops and more. At an additional cost, you can even go rock climbing, rappelling, valley crossing, guided treks and several such activities. Overnight in tents. Try your hand at valley crossing and other adventure activities. Wake up, and go out for a morning walk to explore the campsite. You'll check-out of the campsite by 12:00 hrs. Depending on availability, you can even extend your stay at the campsite. Your trip ends here. Wake up to gorgeous views of rolling mountains and forests. The check-in time at the campsite is 13:00 hrs. You'll be accommodated in deluxe tents that are equipped with king-sized bed, mattresses, blankets, side table, fan and chairs. The tents come with an attached washroom with running, hot water. Today's meal package includes lunch and dinner, served at the common dining hall. The cuisine served may include verities of Indian, South Indian, Chinese, Mughlai and traditional Himachali preparations. Deluxe tents with bed, blanket, tables, fan and chairs. Today's meal package includes breakfast. You'll also be served morning tea and cookies. The check-out time at the campsite is at 12:00 hrs. Depending on availability, you can even extend your stay at the campsite. Common dining hall serving buffet meals. The campsite is accessible via road with an 8-hr drive from Delhi and 4-hr drive from Chandigarh. You can board a flight from any of the major cities of the country and fly to Delhi and Chandigarh. Alternatively, you can board a train to the Kalka railway station and reach the campsite via a 3-hr cab ride.